Let’s all admit one thing: keeping up with the fast-paced and insanely busy world can be too overwhelming sometimes. We live in a constant state of stress and anxiety because of our nature to want to please everyone we interact with - colleagues, friends, family members, etc. At times like this, all you want to do is be selfish and shut off the world, and that’s completely fine! Getting cozy with a good book, relaxing in a hot bath, or just simply taking a scenic walk are all examples of ways to help your mind and body calm down. In your journey to relaxation, you’ll find that a lot of aromatherapy blends, lotions, teas, and more include chamomile. Chamomile is an immensely popular herb known to relieve stress and it can play a big role in your alone time when used efficiently. Having a regular nighttime skin care routine is also one way of destressing after a hectic day. The stress-preventing effects of chamomile is not only beneficial to internal health, it is applicable to external stresses as well. 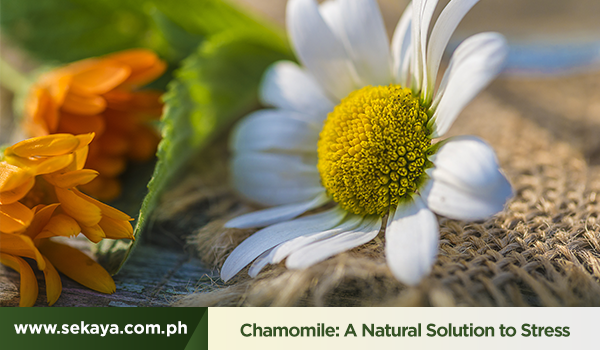 Chamomile is effective against bacteria, swelling or any kind of skin irritation. Keep an eye out for topicals, serums, or treatments with chamomile as an ingredient to help your skin calm down. According to sleep experts, a calm and relaxing environment is needed in order to enjoy a good night’s rest. That means keeping the bedroom tidy, using relaxing or neutral colors like blue or grey, and having minimal light sources. However, you can always add a touch of serenity and security to your bedroom by having a chamomile aromatherapy diffuser. If you want something simpler, you can always spray some essential oils that contain chamomile and lavender to make your bedroom the perfect sleep chamber. Classic symptoms of anxiety include constant migraines, fatigue, and restlessness. Chamomile can help increase serotonin and melatonin levels in the body, which then eliminates stress and worry. That is why after a hectic day, it’s good to relax with a cup of this soothing herb to relax and sedate your mind and body and uplift your spirits at the same time. In addition to chamomile, Cozy Calm contains peppermint leaf, wood betony, and catnip leaf. Each serving of these ingredients create the perfect harmony of natural sedatives so you can unwind and prepare for a good night’s rest. Pause and have your healing moment with daily servings of Sekaya Botanic Infusion.